In the middle of labor with my second child, I had a panic attack. It happened when my epidural kicked in and I realized I couldn’t feel my body. I panicked. After spending hours in excruciating pain of back labor and feeling the sweet sensation of the pain subsiding, I realized I couldn’t move. “Ma’am, I see in your chart that you have a history of anxiety. You need to calm down. It’s not good for the baby to hyperventilate. You’ve been distraught from the moment I walked in” she responded. What? Calm down? Yes, of course I was distraught when she walked in…I was in labor! Here’s a healthcare professional in a position of support and medical care provision for laboring women …and this is the response that I get? There are several issues at play here. One, is that effective interpersonal skills should be an integral requirement for healthcare providers. Treating people with consideration goes without saying. Two, is the bias of mental health. Yes, anxiety appears in my health record. So what? It appears on many people’s health records. What in the devil’s name is it doing clouding my birth experience? “We actually we gave you more anesthetic than we normally do because you were in so much pain,” the nurse adds when I try hard to collect myself by forcing my attention away from feeling like I’m locked in a body that weighs a thousand pounds. The truth comes out. I’m not supposed to feel this way physically and my psychological response is not unreasonable either despite being made to feel like I’m irrational by my L&D nurse. A hefty research literature coupled with anecdotal evidence reports that clinicians are vulnerable to unconscious biases based on a variety of factors including race, socio-economic status, gender (Stone & Moskowitz, 2011) and mental health. A 2000 study reveals that physicians are less likely to take patients’ complaints of headaches and abdominal pain seriously if they have prior history of depression. This study is one in a number with similar findings. It is an incredibly unsettling finding suggesting that patients have a reason to worry that mental health problems appearing on their chart will influence the safety and quality of their subsequent medical care. 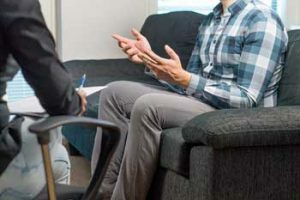 This situation may dissuade people from seeking help, which is a significant safety issue in a society where that rates of depression, anxiety, and subsequently, suicide, are already on the rise. I certainly feel dissuaded. Is that what happened to me? The nurse was biased to attribute my panic to my history of anxiety rather than a healthy response to a psychologically and physically uncertain situation. Ironically, my history should have elicited the opposite response altogether – one that fosters empathy and support. In a society where the conversation about mental health is ramping up, our healthcare professionals should serve as examples of responding mindfully to patients regardless of mental health status. This requires both a formal education and continual training highlighting the need to deliver care that is as considerate of mental health as it is of physical. As a psychologist and a researcher in patient safety, I am sensitive to the potential of a less than ideal outcome that my nurse’s response could have yielded. Had I continued to panic, my baby may have gone into distress resulting in a C-section, bringing with it additional and unnecessary complexity. And if a negative outcome had occurred, it would never be traced back to a nurse telling me to “calm down” rather than offering effective guidance on how to do so. Thus, stories that do not result in harm (but could have) remain untold. Our behaviors and responses impact the individuals around us especially when one is in a position of authority or of care provision. Elizabeth Lerner Papautsky, Ph.D is a human factors psychologist who studies decision making in complex environments at the Department of Biomedical & Health Information Sciences at the University of Illinois at Chicago. Based on both personal experiences and research, her passion is patient safety – particularly, ensuring that relevant aspects of the patient story don’t fall through the cracks.